We use the word combo “old fashioned” to describe lots of things. Old-fashioned cars, old-fashioned diners, old-fashioned tools and so on. The terminology suggests something of the past. Something original. Something classic and, in its time, something prestigious. You’ve likely seen it on drink menus too, usually under “classics”, as the recent craft cocktail trend in America plants its flag in hipster neighborhoods. Yes, double-digit dollar signs attached to elaborate combinations of liqueurs and aperitifs of all sorts now decorate most refuges and speakeasies. You can keep your IPAs, I declare; the cocktail is back and it’s a great time to be alive. The old fashioned quite literally refers to the old-fashioned way of making a cocktail. The original cocktail, some might say (though the historians will award that honor to the Sazerac). The recipe, much like the flavor profile, is classic and simple: sugar, bitters, spirits and maybe a splash of water to dissolve the sugar. Those bitters, those ever so important wardens of balance and complexity, are not to be ignored. They tie it all together. They are the crossroads between the sweet, the sour and the salient. In his book “Bitters – A Spirited History of a Classic Cure-All” Brad Parsons writes: “One of the biggest misconceptions about bitters is that using them will make your drink bitter. Although this is understandable—tasted by themselves, bitters often taste slightly bitter or bittersweet—the term “bitters” refers not to a specific flavor but rather to the category of aromatic solutions made with bittering agents such as gentian root and cinchona bark. Bitters are essentially a liquid seasoning agent for drinks and even food, and their frequent description as a bartender’s salt and pepper hits close to the mark”. I’ve developed quite the affinity for bitters and my liquor cabinet bares proof. On hand I have 18 different bottles: from the classic standbys of Angostura and Peychauds, to the more artistic type such as Chocolate, Habanero Shrub, Cherry Bark Vanilla and even Memphis BBQ (one of my favorites). Every time I go to the liquor store I come home with a new flavor to experiment with. Beer brewers can cry themselves to sleep. The old fashioned calls for Angostura bitters. Which is perfect. A classic deserves a classic. Angostura bitters are just a few decades younger than bourbon itself. There was, once upon a time, the great Angostura shortage of the late 2000s, in which drink prices skyrocketed. My friends, I cannot imagine an old fashioned without our almighty Angostura compound. Nor can I imagine the going rate of cocktails increasing. The average tax for a well-crafted libation is $12—too much as it is. But old fashioneds need not to be ordered out. They are one of the most simple and straightforward drinks in existence. Before getting into the recipe let’s dive into what is NOT an old fashioned. Old fashioneds do not have fruit in them. I see this all the time. Establishments boast their fashioneds on their menus but then the barkeep reaches for his orange and smashes away. Please don’t do this. And if you do, don’t call it an old fashioned. Remember the first paragraph? Let me quote for you: “The terminology suggests something of the past. Something original. Something classic and, in its time, prestigious”. Let me also clarify and dissolve the level of pretention and the “get off my lawn” perception I may be bestowing upon myself. I like new fashioneds. In fact, on one formidable evening some time ago a close friend and I were celebrating his wife’s recent collegiate accomplishments. We took to muddling blood oranges with Fee Brother’s rhubarb bitters then stirred in the usual amount of bourbon and simple syrup. The concoction was quite good so the process was repeated several times. Needless to say, we were not all equals the following morning. I guess this is my way of saying I like perverted drinks, I just want them to labeled correctly. Just recently peaches have reached peak season. So naturally I muddled them and drank them with whiskey. It didn’t work out as well as I was hoping but the point is, I’m willing to drink new fashioneds. The classic, however, is a classic and there’s no beating it. The first is muddled fruit, of which we’ve covered extensively. The second is too much sweetener. The third is bad whiskey. The drink should not be sweet. This is the biggest problem I have when ordering these out. It should be cut with sweetness, but not sweet. I use simple syrup so I can control it. For a while I thought it was cool to soak a sugar cube with bitters and smash away. And that is cool. But simple syrup is the way to go. Bad whiskey is bad whiskey. You’ll never get around the influence—the bite and bitterness—bad whiskey is going to have. It doesn’t have to be expensive whiskey. It just can’t be the gut-rot that’s sold for $19 a gallon. Spend at least $35. Or remember that life is short and buy a bottle of Woodford Reserve. Combine the whiskey and simple into a cocktail shaker with ice. Give it four or five shakes of Angostura bitters and one or two drops of Fee Brothers Old Fashion Bitters. Note that the Fee Bros Old Fashion Bitters features a cinnamon/allspice character. And like all of their bitters, whatever the flavor it claims will be VERY forthcoming. So one drop is plenty. Two drops is nearly excessive. Eliminate it altogether if you wish but I like the added level the cinnamon provides and it doesn’t seem to interfere with the aromatics of the Angostura. What happens next may be the most important thing you’ll ever learn. Never. Shake. The old fashioned. Like a baby. Stir. Stir for several seconds. At least 15. Twenty is better but at least 15. A good stir will incorporate all of the flavors so they’re all getting to know each other, and the drink will be well chilled. Then, finally, strain into an old fashioned glass (see how important this cocktail is? It has a glass named after it) with one large ice cube. The large ice cube is important. It keeps the drink cold without further delusion. If you do not have large ice cubes, just pour it on rocks and drink it faster. Orange peels are very flammable so this is super easy. 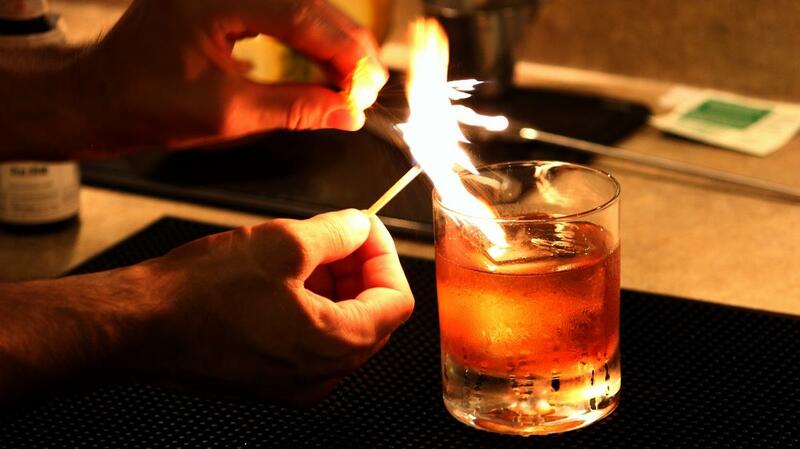 The flamed citrus adds a mild smokiness to the drink. But never use a lighter for this process unless you enjoy the flavor of butane. Use a wooden kitchen match as shown in the video. After flaming the twist rub it around the edge of the glass a few times and then drop it into the cocktail. As you sip, the whiskey will inherit the bitter and the sweet of the orange, making it better and better with each tilt. Oh, and about the whiskey. I told you not to buy cheap. But should you use bourbon or rye? This is totally up to you. I like bourbon because it’s sweeter and it allows me to back off the simple syrup (hence the quarter ounce). Since you are now an expert, you get to choose what you’ll use. Taste the whiskey. Talk to the whiskey. Listen to the whiskey. Learn from the whiskey. Rye is generally spicier so you may need to increase the simple syrup to a ½ ounce instead. If you’re rich, or lucky, you might have a bottle of Whistle Pig lying around (rebottled Canadian whiskey). It is really spicy and needs more sweet. Woodford Reserve doesn’t need as much sweet (or as much paycheck). Use your tongue and your instincts. So there it is. The definitive old fashioned. Feel free to experiment with different bitters and whiskeys and even fruits. But just be careful what you call it when you serve it.